Getting out to the greenhouse still requires YakTrax and ski poles; the husband cleared a path with the snowblower after the last snow, but there are icy spots in the shadows. Once we start seeds, we have to use the propane heater at night. The husband is usually in charge of turning it off in the morning and on at night, and I go out during the day to open vents and water seedlings. I am putting off planting until this weekend in hopes that more snow will melt. Rain would do a great job of melting the snow, but we’re all enjoying the sunshine too much to want more precipitation. Still no sign of chipmunks, which is good. They are rather nosy and I’ve been expecting to see them darting around when I’m out there. I have not seen any garter snakes, either. I did see a turkey hen sitting in the pig pasture. I wondered if perhaps she was sitting on a clutch of eggs, but there was still too much snow for me to get over there and take a look. 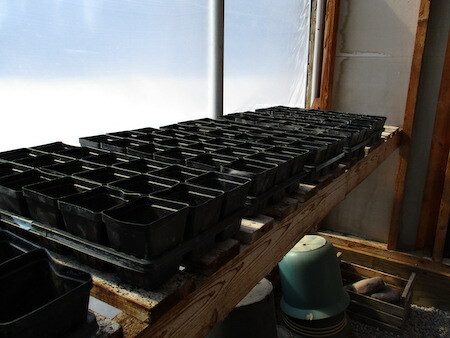 We don’t have as many seeds to start this year, partly because we’re doing more crops that direct seed into the garden and partly because we’re not planting as much or as many varieties. I have to keep reminding myself that the focus of this year’s gardening season is going to be on getting some things under control (I’m looking at you, raspberries) and putting in some infrastructure (we need a solid, permanent pea trellis and the husband has promised to build one). Our tomato crop was a bit of a bust last year. I’m hoping for better this season. Nothing is going to happen, though, until the snow is gone. It’s so hard not to be impatient. I got a big chunk of the deadline sewing project done this morning. I took the insulated curtains off the windows upstairs, too, and it’s so nice to have those rooms flooded with sunshine while I sew. I experimented a bit on this pincushion. I did blanket stitch around most of the pieces. For the white of the egg, I used perle cotton. For the red comb, I used some red Aurifil wool—it’s lovely to work with and I am going to pick up a few more spools. For the rest, I used 2-3 strands of DMC embroidery floss. I am itching to get started on my wool penny embroidery. It’s going to have to wait until this weekend, though; I am playing for the Lutherans tonight and I have to chair a church council meeting tomorrow night. I love how embroidery is fairly easy to pick up and put down. It’s a lot like knitting that way. It’s an oldie but a goodie and chock full of useful information. I’ve pulled it out more than once when more modern reference books have failed me. I’ve got all those Reader’s Digest songbooks, too.